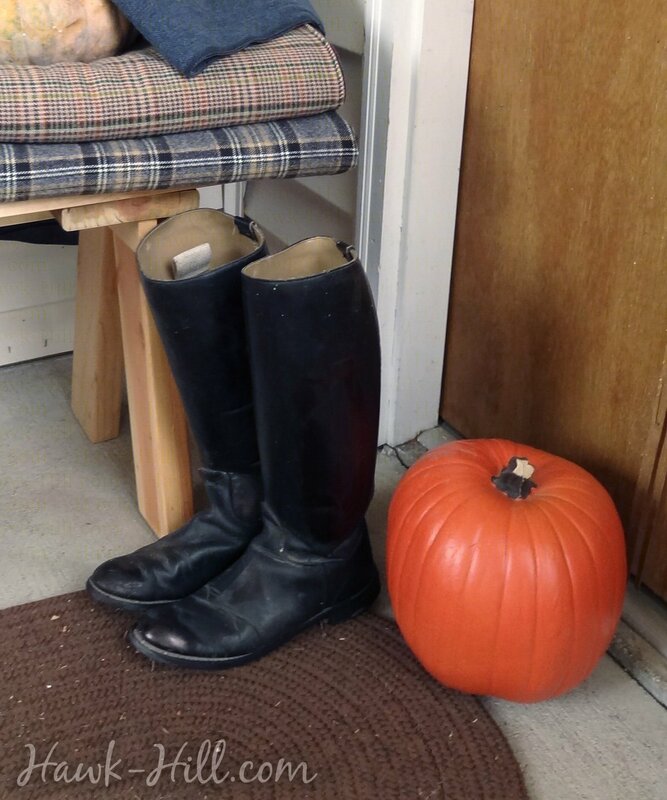 I love decorating with old English riding boots and English saddles, but often the condition I find these items in is far from pristine. While I enjoy weathered antiques and authenticly storied items, when it comes to leather, often conditioner and dye make the difference between an item that belongs in the trash and an item that compliments a sophisticated equestrian-inspired look. 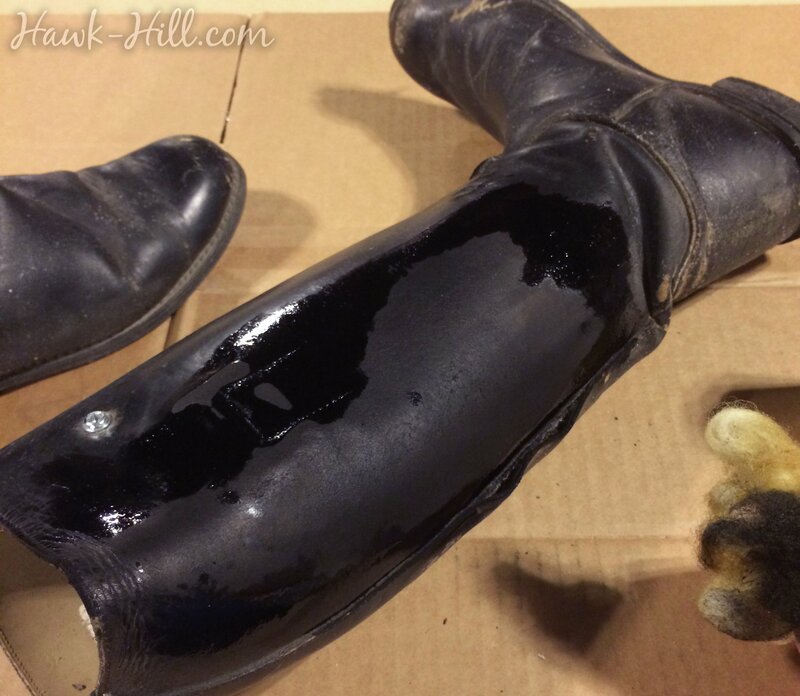 Below is a great example of the transformation of a pair of riding boots from “ugh” to fab! I stumbled across these boots at a thrift store. 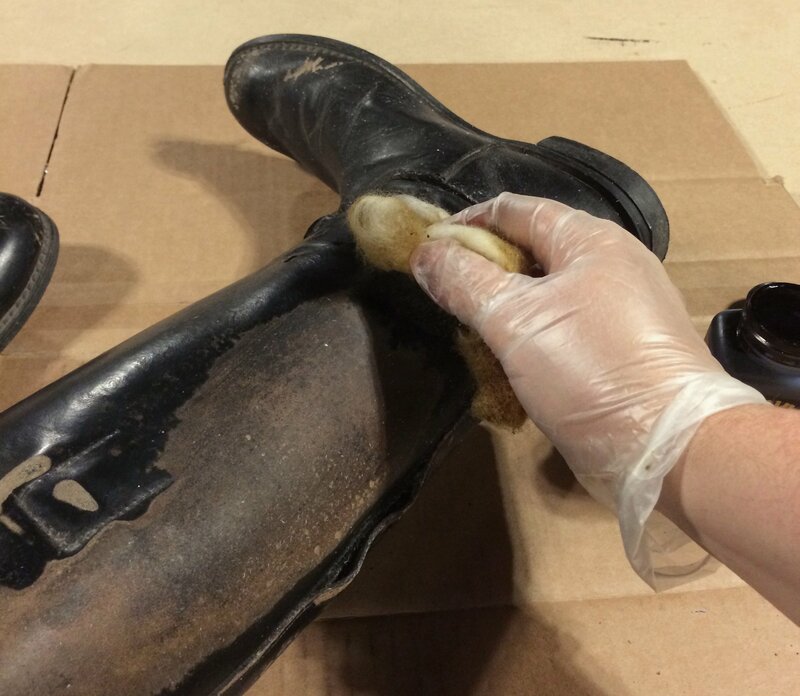 Commonly with cheap riding boots, friction between the rider’s leg and the saddle discolors or even removes the dye from the inside of the boot. 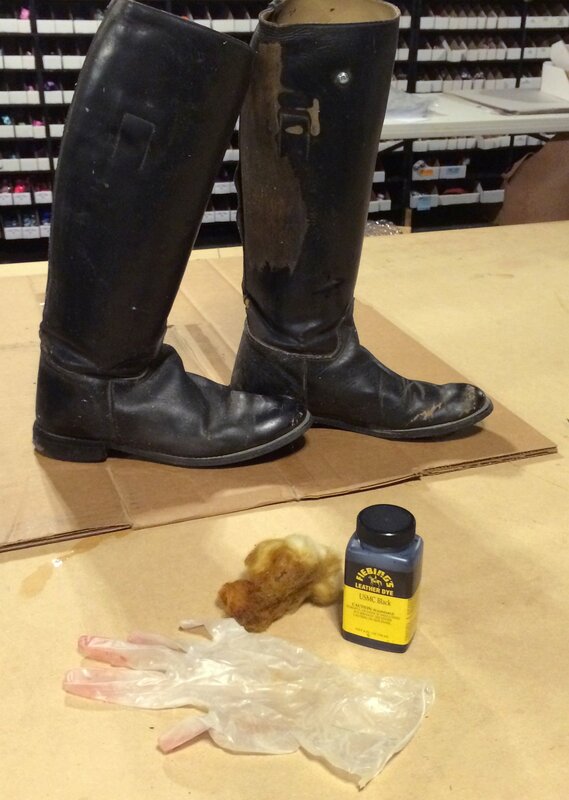 To restore these boots to display-condition, the boots needed black dye added to the discolored surfaces. 1. Start by cleaning your leather item. 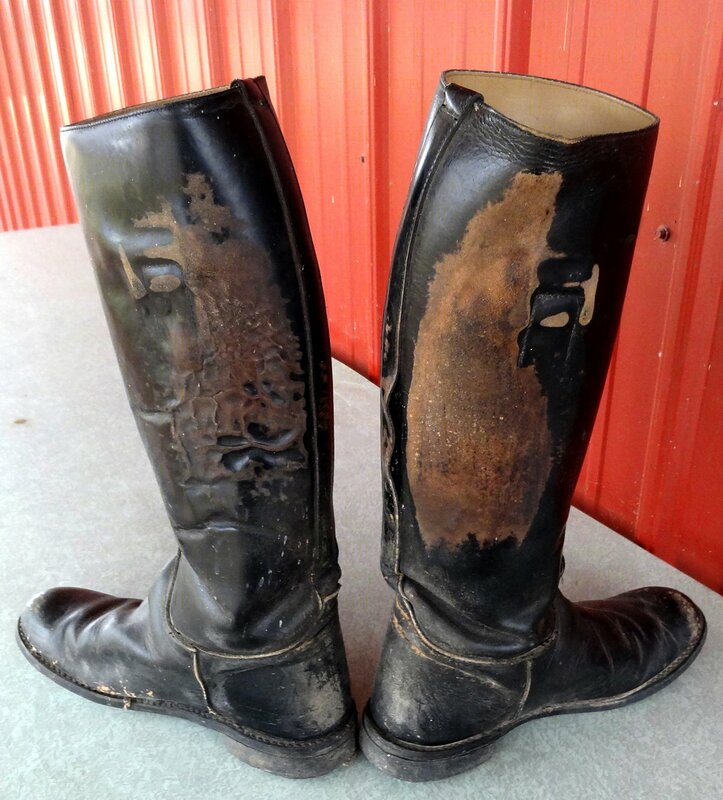 It may be tempting to just wipe the item down, but leather goods like boots and saddles will have a tough gummy substance built up on the surface, a combination of dirt, horse sweat, and the oils present in leather. Scrubbing with soap and water is necessary to remove this residue. Use as little water as possible, but do clean thoroughly. Oiling later will restore any oils lost during cleaning. 2. Once completely dry, it’s time to dye your item. A local leather shop can help you match shades of brown if you are dying a delicate item, although another option if you are working with a light colored item is to dye the entire surface a darker shade. 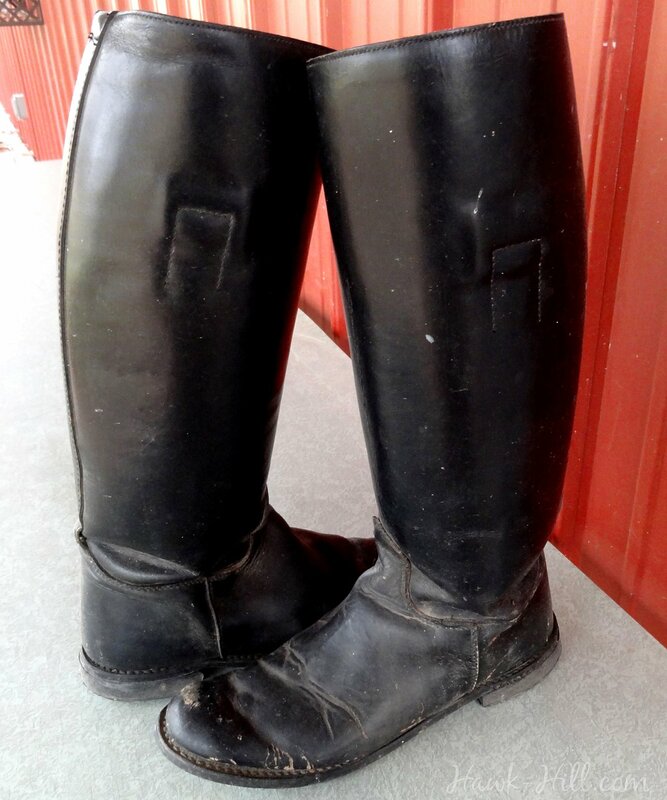 When working with black items such as riding boots, Fiebings Black Leather Dye is always a safe bet- I’ve done perhaps a half dozen black boots and saddles with no color matching issues, using this inexpensive but professional grade dye. Using dye can be messy! Prepare and be careful- you can make a big mess if you aren’t careful! 1. Prepare your area: You WILL permanently stain whatever surface you work on, so plan ahead. I recommend working on top of a flattened cardboard box placed on top of a trashbag or plastic drop cloth. The cardboard is very absorbent, preventing drips and splashes. Wear clothes you’d paint in. In these photos I’m working on cardboard placed on top of masonite sheet which is on top of my countertops. 2. Prepare your tools: You’ll need dish gloves or latex gloves and something to transfer dye with. Sometimes the dye comes with a dab of wool, but you may need something larger. I use a chunk of wool roving and in a pinch use paper towels. 3. Dye: Working quickly but carefully, paint the dye onto the surface of the leather. The dye may sit for a few minutes on the surface of the leather- especially in spots where the original finish is in tact- but that’s ok. Let the dye sit on the surface for a few minutes. Most dye will absorb immediately, let sit for 2-3 minutes and wipe off the excess dye with a clean, soft cloth. You may need to buff with a bit of elbow grease to restore a nice finish. You’ll see lots of improvement after one coat, some items like saddles usually need a second or even third coat to penetrate the leather fully. The majority of the dye will absorb into the leather almost instantly. Fiebings dye is alcohol based, and will dry quickly. Once completely dry you can put the item to use immediately! You may wish to oil or condition the item to prolong life and restore the oils lost during the cleaning step. 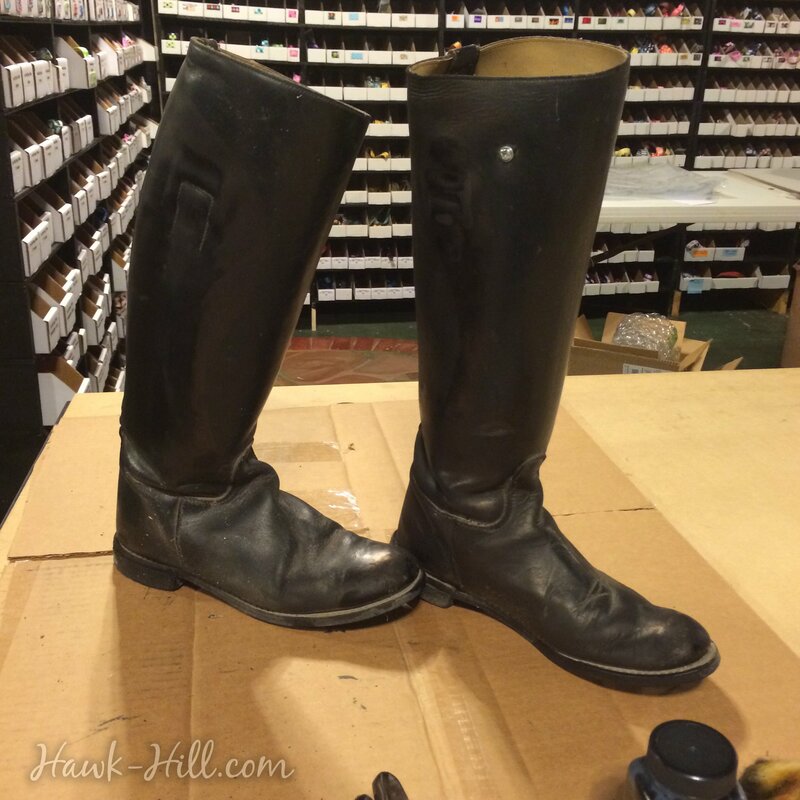 TIP: Getting Riding Boots to Stand Straight. 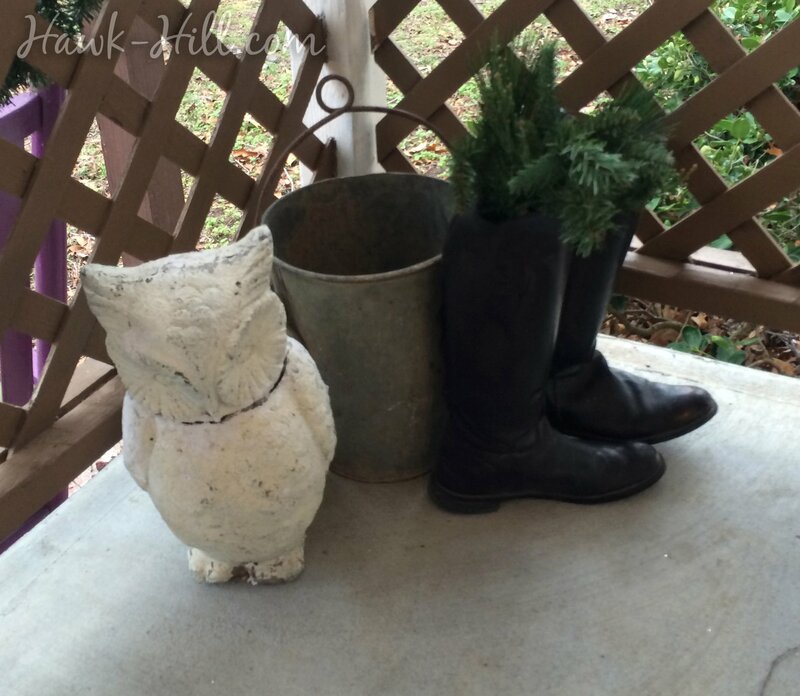 Traditionally riding boots were stored with wooden boot trees, which look beautiful but are difficult to find and very expensive now. 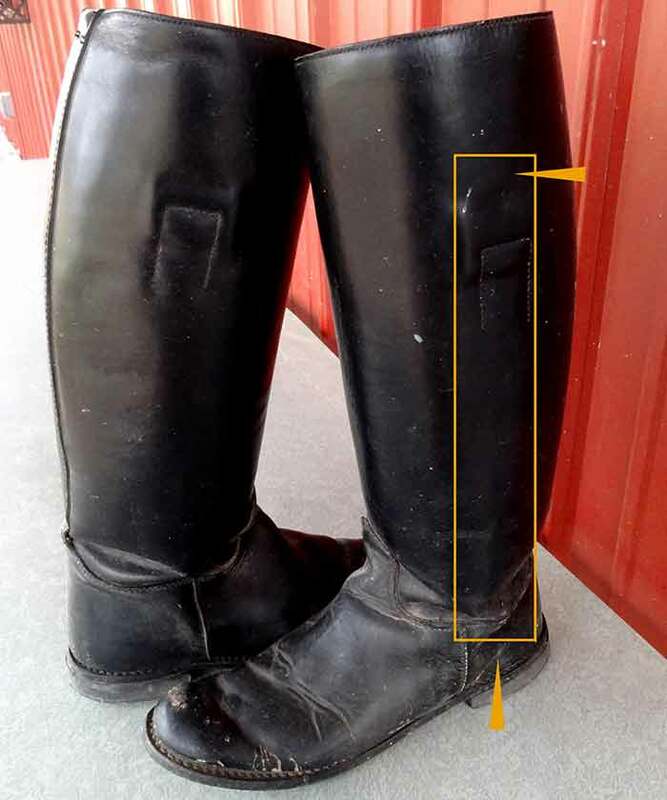 There are many functional plastic options for “working” riding boots, but for display it’s difficult to find an option that will look vintage and support the boot properly. To hold the boots upright that I use for display, I now cut and place a 2×2 inside the boot. Screwed once through the sole, and once to the back of the calf, boots with a board secured as illustrated will not sag or tilt, and still have room to be used as a vase for flowers or greenery as the seasons change.